Insert eighty gigabytes of storage space into your network with the EtherFast Instant GigaDrive from Linksys. Compact and powerful, this Network Attached Storage (NAS) device adds gigabytes of storage to your network without adding the cost, space, and maintenance hassles of a typical file server. 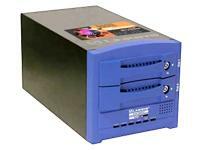 The Instant GigaDrive provides solid data transfer for multiple client connections. It is also equipped with a built-in print server for the quick and inexpensive addition of a network printer and an extra drive bay so you can add an additional drive as your network needs demand. The EtherFast Instant GigaDrive's 10/100 port will automatically adjust to your network's speed. Equipped with a self-repairing feature, the Instant GigaDrive's comprehensive, web-based utility software offers a wide array of management options. The Instant GigaDrive also functions as a standalone DHCP server for easy installation.